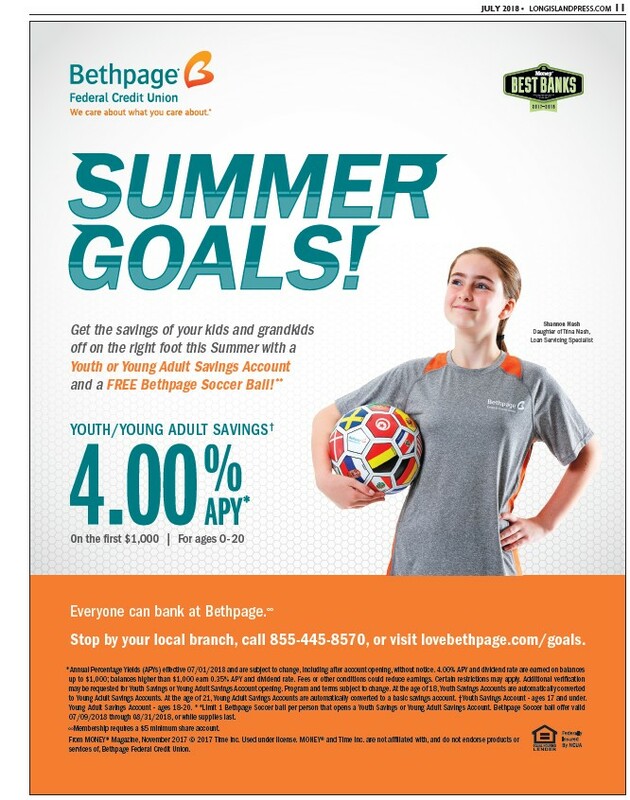 JULY 2018 • LONGISLANDPRESS.COM 11 Get the savings of your kids and grandkids off on the right foot this Summer with a Youth or Young Adult Savings Account and a FREE Bethpage Soccer Ball! ** YOUTH/YOUNG ADULT SAVINGS† On the first $1,000 | For ages 0-20 Shannon Nash Daughter of Trina Nash, Loan Servicing Specialist Everyone can bank at Bethpage.∞ Stop by your local branch, call 855-445-8570, or visit lovebethpage.com/goals. *Annual Percentage Yields (APYs) effective 07/01/2018 and are subject to change, including after account opening, without notice. 4.00% APY and dividend rate are earned on balances up to $1,000; balances higher than $1,000 earn 0.35% APY and dividend rate. Fees or other conditions could reduce earnings. Certain restrictions may apply. Additional verification may be requested for Youth Savings or Young Adult Savings Account opening. Program and terms subject to change. At the age of 18, Youth Savings Accounts are automatically converted to Young Adult Savings Accounts. At the age of 21, Young Adult Savings Accounts are automatically converted to a basic savings account. †Youth Savings Account - ages 17 and under. Young Adult Savings Account - ages 18-20. **Limit 1 Bethpage Soccer ball per person that opens a Youth Savings or Young Adult Savings Account. Bethpage Soccer ball offer valid 07/09/2018 through 08/31/2018, or while supplies last. ∞Membership requires a $5 minimum share account. From MONEY® Magazine, November 2017 © 2017 Time Inc. Used under license. MONEY® and Time Inc. are not affiliated with, and do not endorse products or services of, Bethpage Federal Credit Union.